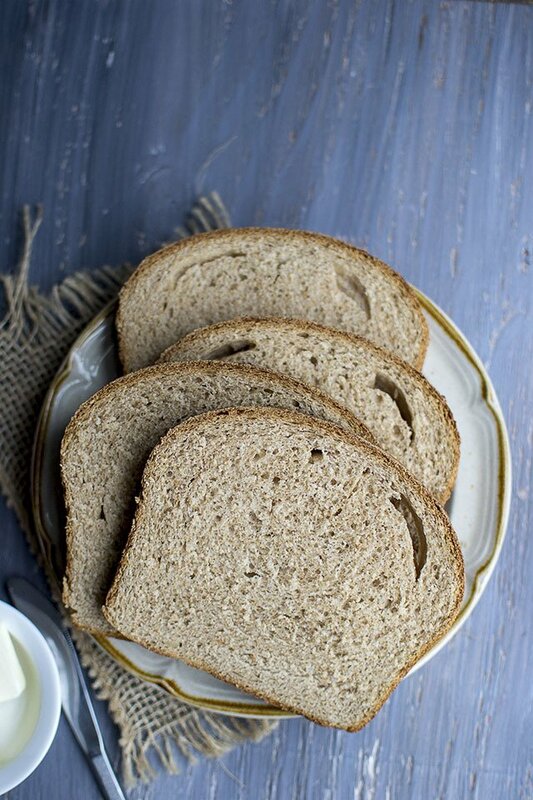 100% Whole wheat bread that is moist, tender and studded with Walnuts. Easy to make and great as toast and for sandwiches. Combine all the ingredients for the dough in a large mixing bowl or the bowl of a stand mixer. Mix until a shaggy dough forms. Cover and set aside for 20 minutes. Mix and knead until the dough is smooth and pliable, about 5~6 minutes with the machine or 8~9 minutes by hand. Transfer the dough to a lightly greased bowl and set aside to rise for 1~2 hours, or until doubled in volume. Gently deflate the dough and shape it into a log. Place it in a lightly greased 9"x5" loaf pan. Cover and let rise for 1~2 minutes or until it's crowned about 1"~2" over the rim of the pan. Preheat the oven to 350°F. Bake the bread for 40~45 minutes. Tent it lightly with a foil for the final 20 minutes to avoid over-browning. The bread should have a golden brown crust and the interior should read 195°F~205°F on an instant read thermometer inserted into its center. Remove from the oven, and after 5 minutes, turn it out onto a wire rack to completely.